PHUKET: Several roads in heart of Phuket Town will be closed in the afternoons and at night during the three days of the “Chinese New Year – Back to the Past” festival, which begins today (Feb 21). 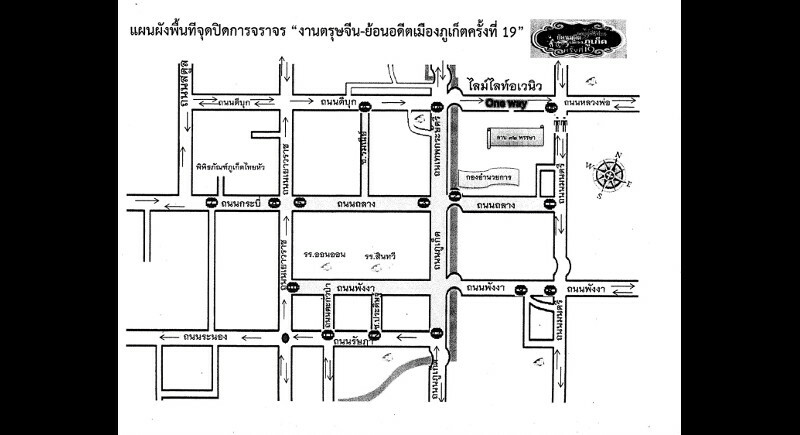 The map as provided by Phuket City Municipality. The three-day Phuket festival, which concludes on Friday (Feb 23), comes five days after the Chinese New Year festival elsewhere began throughout the country – and around the world – with the Lunar New Year last Friday (Feb 16). At 4pm to midnight (type of traffic closure not specified). All roads affected will reopen to traffic at midnight, confirmed the notice.